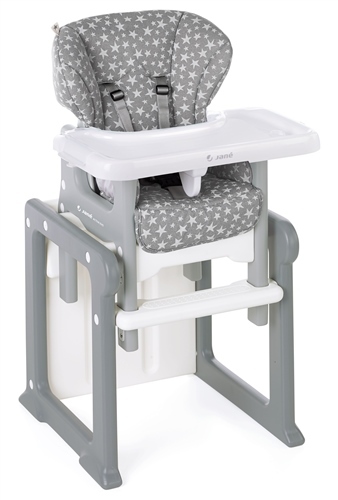 3 in 1 Multi-functional Reclining Cubed Highchair and Lowchair. The Activa Evo cleverly transforms from a highchair to a reclining stand alone chair or junior play table and chair for your growing child. This multi-award winning, multi-functional 3 in 1 reclining cubed highchair is built from robust ergonomically shaped plastic for safety and optimum comfort. Suitable from 6 months - 3 years. Converts into a low chair and also junior table and chair. 3 position adjustable feeding tray. Double feeding tray for hygienic eating and playing. Removable washable padded seat upholstery. Full 5 point safety harness. Ergonomically shaped plastic for safety and optimum comfort. This highchair is very well made and designed. The straps are simple to do up and release and can be adjusted to suit the child. The highchair easily converts into a floor height chair and tray, or can be used without the tray. The base turns over to make a small table. It is easy to keep clean and light to move. My granddaughter also likes to use the base as a little house to crawl into with her fluffy animals. We are very happy with our purchase. The set has a nice wide seat, which my chunky toddler enjoys, as many are narrow. The chair clips into the table section, so when husband picks it up by the chair part it stays together, a feature I have appreciated as I have had sets in the past which did not have this. Also it is light enough to move around, sliding or lifting.All I would wish for would be that the straps would come off to make cleaning even easier.